This is the new home for the TLF project. This project has been taken over from Rein Couperus, PA0R, in 2009 by Thomas Beierlein, DL1JBE, for maintenance and further development. 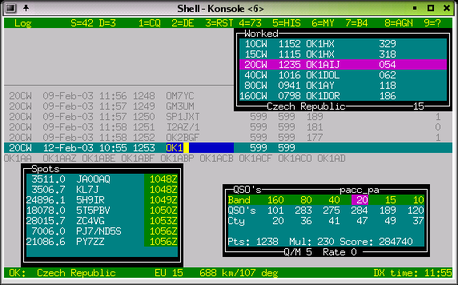 It supports the CQWW, the WPX, the ARRL-DX, the ARRL-FD, the PACC and the EU SPRINT shortwave contests (single operator) as well as a LOT MORE basic contests, general QSO and DXpedition mode. It interfaces with cwdaemon or winkeyer daemon for morse code generation and with your sound card for CW/VOICE keying, connects to a number of radios via the Hamlib library and has a built-in client for DX cluster connection. Sound recorder facility to record voice keyer messages and complete contest. You can download the source code for the last packaged version (TLF-1.3.2) here. It must be compiled after unpacking (see below). You will need some further packages for building TLF. Glib-2.0 for supporting C functions. xplanet which allows you to see the latest DX spots on the globe. TLF uses automake and autoconf for building. Starting with TLF-1.0.0 you need pkg-config too. By default TLF will be installed into /usr/local/bin, together with the shell-scripts in the scripts directory. Data files will be installed into /usr/local/share/tlf. If you want to change any of these paths, you can do this with configure too, e.g. will install TLF and scripts into /usr/bin and datafiles into /usr/share/tlf. There is a low volume mailing list for TLF usage and development at tlf-devel@nongnu.org. Feel free to join in and ask your questions. Furthermore you can browse the list archive at http://lists.nongnu.org/mailman/listinfo/tlf-devel where you can find a lot of useful informations. clone the repository, make changes and send patches or pull requests. review the documentation and provide corrections or additional information. You can find a copy of the original help page for TLF-0.9.9 here. A new help page has still to be written.